The testy issue of sanctions and travel bans have surfaced again, with more urgency this week after New Zealand's willingness to offer Roko Ului Mara political asylum if he asks for it. Prime Minister John Key revealed last week Mara could be allowed in and that Foreign Affairs was looking into how it could be done. He's since said there's no reason why Mara and his wife, Dolores Thaggard, shouldn't be allowed residence since the former military officer has defected. Key's enthusiasm has ticked off the illegal prime minister, Frank Bainimarama, who is still trying to have Mara, who he describes as a 'fugitive', extradited from Tonga. Bainimarama is questioning Key's motives, and is suggesting hypocrisy saying New Zealand refuses to relax the bans for sports people in the military. The regime was already starting to make noises recently about defying New Zealand and spoiling the World Cup by not attending. The chair of the Fiji Rugby Union, Colonel Mosese Tikoitoga, now says Fiji may not take part in the New Zealand and Australia 7s IRB tournaments next year if the travel sanctions remain in place. Tikoitoga says the board has written to the IRB asking if it will allow the New Zealand government to dictate which players will make its 15's team to the World Cup in September. He says the Key government is directly interfering in team selection and is stopping Fiji from sending the best team. The travel bans have been controversial at times in recent years with some ruling seemingly inconsistent at times. Should the New Zealand government allow Roko Ului Mara into the country as a political refugee? Should other soldiers who want out of the military regime also be allowed into New Zealand as political refugees? Na boci ga na boci! Why can't you and your puppet masters understand that NZ is a sovereign state - who they let in or not is up to them - not up to some stupid ex-clerk like you! Dua ga na nomudrau mata vei domi boci kei Voreqe. Esa drakusi mai na nona soresore ena levu ni nomu tabetabe! The ban on military personnel setting foot on NZ including international actions such as expulsion from Commonwealth are in relation on the military for crimes AGAINST FIJI CITIZENS eg illegal usurption of power, murders and torture of innocent against citizens and delay in democratic elections. The punishments override the rights of the military to play games in NZ and Australia. To Bainimarama and your illegal collegues, shove your arrogance up your rear ends, NZ will not bow down to your blackmail. Fiji military personnel will not set foot on NZ soil and the Rugby World Cup will go ahead and not blink an eye for a tiny spec in the Ocean called Fiji whose absence from rugby games will never bother anyboby. The onus is on Bainimarama to return Fiji to democracy NOW. Fiji did very well in the IRB London 7s tournament but taunting actions like that of Nikola Matawalu in Monday’s Fiji Sun (May 23) taunting the opposition South African player with his tongue can always kick back and cause any team to fail. That was bad sportsmanship and rude, mixed with pride which goes before a fall. Well, we sure did fall at the last hurdle even through we performed very well. Our national sevens teams should not resort to taunting and showing-off actions and need to examplify humility and good sportsmanship on and off the field. Ooooohhhh, this is a tricky one.. then if he does go to NZ as a refugee, will that mean he wont be able to go back to Fiji? Or will he be allowed to go back to fiji afer its all over? Geepers, Vuaka is one dumb phuck. The sanctions have been in place for ages now, and this idiot Tikoitonga should know better. The IRB cannot dictate to NZ what to do when it comes to the FRU. Tikoitoga's boycott/withdrawal threat is symbolic of him as a soldier - hollow and a load of SH*T. The IRB is very clear on what happens to contracted unions which withdraw or boycott the 7s series. FRU is a committed union to the world 7s series. If Tikoitoga didn't know that when he opened his mouth, he knows it now - William Glenwright (IRB-Pacific) made it crystal clear on Fiji TV last night. Talk about dogs eating their vomit!!! Sa bavulu, sa bavulu ga!! Yes, Fiji shouldn't play in any 7's. That will show them, especially since we won so many tournaments this year...0 in total. Now that is a great idea! Laurai sara mada. This is black mail on the illegal regimes part. No wonder they want to run FRU as a gateway into trying to hold IRB to randsom. VB this will not work for you. Anyway Fiji's 7s performance is no longer seen as enjoyable with the string of unsuccessful performnaces. Frank you already have BLOOD in youir hands from 2000 & 2006 coup, you should be in jail by now. levu tale na lamu man. F UP TO BAI/AG TALIBAN. If my Government wants to restrict certain people from coming into my country, that is our business and has nothing to do with the Fijian Rugby Union or the IRB. Sport getting involved in politics is a no no. It will be a shame if the Fijian Rugby Union or the illegal dictators of Fiji throw their toys out of their cots and not send a team to any competition because it is a pleasure to watch the Fijians play,always. Bainimarama keeps saying that the NZ government can keep out of Fijian business so it is only fair to tell him to keep his bloody nose out of our business. Stay strong citizens of Fiji. Who gives a heck-as if we have any chance of getting to the semi-finals! Save the money and do something useful in Fiji -like feeding the hungry & poor instead of paying perks and wasting money on 20 officials who are just going for a good time in NZ! Whilst the people are life tough-it may be prudent for the FRU to tighten its belt, instead of just going thru another wasteful time as the previous mob lead by the dope Gavoka-who should have stayed true to his calling of wanting to be a POLITICIAN in the Qarase Govt! AS the Lauans say-"riva"! 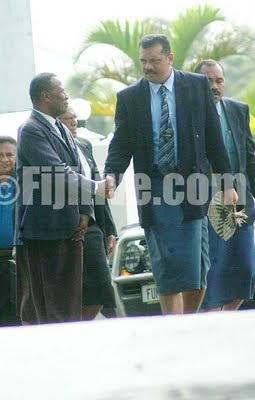 That's the main reason why Vuaka was happy to have a military person heading the FRU. He's betting on the IRB to tell NZ that the Fiji rugby officials be allowed in during the world cup. Bainivuaka, it didn't work and it will not work you dumbass. They should look North and go and play Masipolo with China and India and Cuba. Instead of Melrose 7's it will be called Masipolo 7's. Tikoitoga, don't involve yourself in politics and also don't bring politics into the game we love. Sa rauta mada na tabea tiko na ceke ne i bainivore. sa kalougata ni ko sa mai prmote taki rawa vua na i liuliu ni illegal regime. There a some better people to take charge of the FRU but your plot have been known by NZ and OZ....nomudrau vuku lialia me tikoga vei kemudrau. And stop over for a training run in Vietnam. They should also arrange a game against Iraq then on to Syria and call in the Mid-east 7s. Bainivuaka will be the ref in Iraq. Sad excuse for not giving the promised $3million from minister of sports. nz will never ever give-in to illegal regime. good try but lack wisdom? why can't tuitoga tell the truth No Money for u fru? @ Semi Meo 5:37PM. Vinaka Semi, o keda qori. We just all bind against the FB regime. After 7 mighty rounds, the walls will crumble, so, your voice with us, the better. Tikoitoga.......sobo, just convince your boso to give the $3 million (if he has it) & you can watch on TV. Big kerekere, don't take the $3 million from FNPF, sa no money tiko mada. Well said Tikoitoga..show em who rules....matamu!! !